I have now crossed the hurdle of watching myself on television for an extended period of time, and boy, was it strange. Not only did I notice how many times per minute I touch my hair, but sometimes my voice didn’t even sound like me. Maybe I need to start singing the in the shower more. For those of you who didn’t catch the sneak peek of episode 1 that aired Saturday on BBC America, below is a little clip of what you missed. And to answer what has been many of your follow-up questions: yes, I will totally come cook in your bathroom anytime. I don’t want to give anything crucial away for those of you who will be tuning in for the two-hour season premiere tomorrow. But I will talk about some little bits and pieces that didn’t make it into the final edit. By far the craziest thing about watching the show for the first time was how much of what I lived through never made it on the screen. In the narrative of the show, the challenge was 2 days shorter than it was in real life, which meant they eliminated a good 2 days of our toiling. One of things left on the cutting room floor was perhaps my most memorable meal this summer. The second day of shooting, Cody, Stan, Bianca and I ended up cooking dinner for two couples and their 6 children at one of their homes in the Palisades. They had a beautiful family, and it just so happened to be Memorial Day weekend. We had a blast making classic America dishes – grilled flank steak, corn on the cob, mac n’ cheese, and chocolate chip cookies, which Bianca prepared with the assistance of the little ones. Naturally, I took the reins on the Mac. To save money we tried as much as possible to use pantry staples that they had on hand. And being a family with 3 kids, what they had was tons and tons of cheese – a whole refrigerator drawer’s worth. I made no effort to streamline the assortment – not that I would have had much luck – and instead, just started dumping handfuls of this and that into my steaming pot of béchamel. I did this with the confidence and wisdom of a Swiss fondue maker, mainly because, it was only recently that I was faced with my own drawer of half-eaten cheese, and decided to go all-in on a gluten-free mac n’ cheese. This was part of the process of preparing for my new subletter who was coming in while I was away on Chef Race. 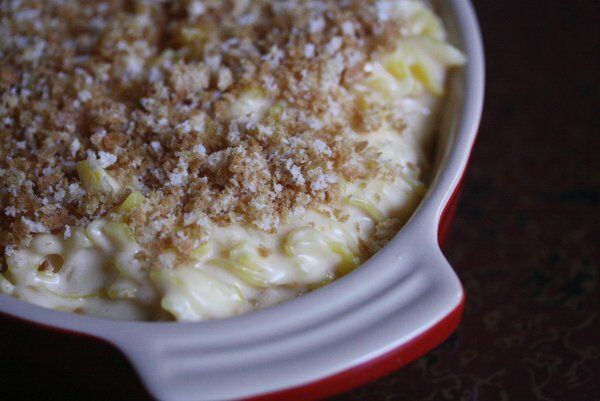 I was bringing the dish to a potluck with close friends later that night, so my main mission was to use up every random cheese possible–everything but the kitchen sink, to be precise–and hope the end result tasted good. In New York, as again in LA, people dug in and dug it. Bianca, after sneaking a bowl in the kitchen, said: “Girl, you stuck your foot in that.” And then she told me that that was a good thing. 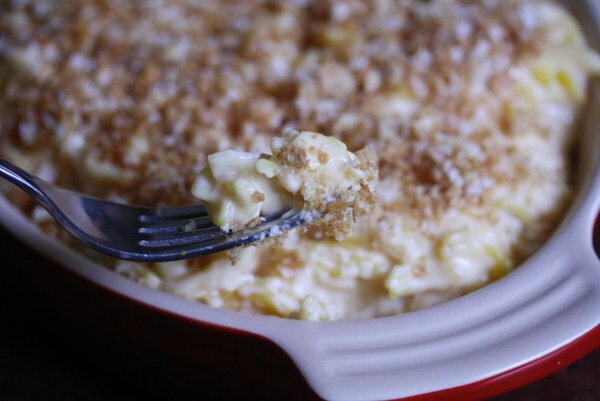 The kitchen sink gluten-free mac n’ cheese recipe below is my contribution to the All-American potluck I’m hosting tomorrow. Bloggers from around the web will be posting their favorite recipes according to the theme, and with the addition of this past week of American recipes from my fellow Chef Race teammates, we should have a pretty great virtual spread. I hope you’ll tune into the site tomorrow morning for the potluck and to enter the Red, White, and Blue giveaway with prizes from Le Creuset, Dream Farm, and Edgeware. And I also hope you’ll tune into the show tomorrow night! p.s. as if there wasn’t enough excitement and change around these parts, I’ll be debuting my new logo in the next day or two. Let me know what you think in the comments section! The main purpose of this dish is to get rid of all the cheese in your fridge - everything but the kitchen sink. I’ve used all of the suggestions below at one point or another in mac n’ cheese. I doubt you will ever end up with all of the below on hand (unless you have a serious cheese hoarding problem, like I do), but feel free to mix and match. To make this recipe non-gluten free simply use regular flour, bread, and pasta. Preheat the oven to 400°F. Butter a large cast-iron skillet, casserole pan, or a 9 × 13-inch baking dish, and set it aside. Warm the milk in the microwave or in a saucepan set over medium-low heat. Bring a large pot of salted water to a boil. Add the pasta and cook, following the package directions, until 3 minutes shy of al dente. The pasta should still have a bite to it. Drain, and shake out all the water. In a large pot or Dutch oven, melt the butter over medium-high heat. Whisk in the flour and cook until it is fully incorporated, 1 to 2 minutes. Add the warm milk and whisk gently over medium heat until the mixture has bubbled and thickened enough to coat the back of a spoon, about 10 minutes. Stir in the salt, pepper, mustard, and most of the grated cheese, reserving about 1/2 cup. Add the pasta and toss to combine. Distribute the mixture evenly in the prepared skillet or baking dish, and sprinkle the remaining cheese over the top, followed by the bread crumbs. Bake for 20 to 25 minutes, until bubbling and browned. 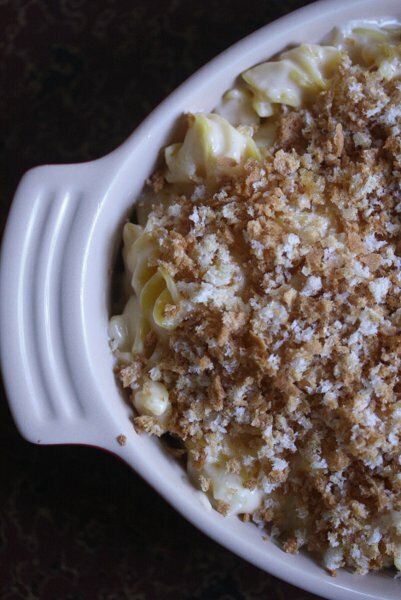 If the breadcrumbs are not browned and toasty, stick the pan under the broiler for 1 minute. Serve piping hot. looks delicious, phoebe! I cant wait for tomorrow night!! i hosted my usual dinner party last friday night and i made this dish (without telling anyone it was gf!) it was a hit!! 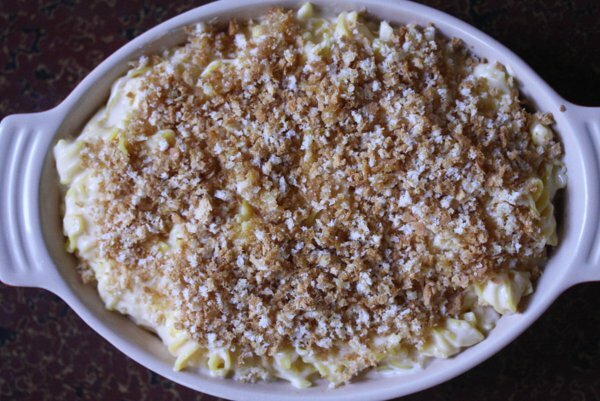 thank you for the recipe- i’ll definitely be passing this along to my fell gff’s! SO glad to hear it!! And I’m totally stealing GFF. Amazing. Yes! Finally someone writes about sklep zlewozmywaki.